How do I strike the right balance between the sample (the end of unit test) and the domain (in this case, the period of history in question)? How do I help my pupils remember what they need to remember for the assessment, as well as helping them to remember what I think is just important for them to remember? And how do I guide them towards an answer without answering for them? In my last blog, I explained why I think the sample/domain issue is one that particularly afflicts the teaching of history at KS3. The more our assessment system leverages the assessment, the more tempting it is for the teacher to narrow the domain and teach to the test. This is particularly so in schools like my own where pupils, even in Year 7, do all assessments without notes and from memory. The alternative, however, is arguably just as bad: unpredictable tests sprung on new arrivals to the school, which help us to norm-reference one pupil against another, but potentially crush a child’s confidence in the process. For this reason, I am in favour of giving younger pupils the question in advance. But only if the question itself avoids the sort of ‘narrowing’ I’ve described. An example of this sort of narrowing might be a very specific question about the significance of the Magna Carta or the ‘greatness’ of Alfred the Great rather than a broader question that aims to assess whether pupils have retained a good knowledge and understanding of the period in question. Alfred the Great is perfectly interesting, but I don’t want my pupils’ appreciation of Anglo-Saxon history totally dictated by what could become both a semantic and substantive discussion of his ‘greatness’. In part, as was put to me, this is just the age-old question of breadth vs. depth. In the case of history, we often choose to sacrifice breadth over depth. With a limited amount of time, we cannot possibly cover everything that happened in, say, Anglo-Saxon or medieval England. We also want to ‘scale-switch’ and to help our pupils see continuity and change in the short, medium and long-term. I think this is true. All enquiry questions are equal, but some are more equal than others. I think we can find a Golden Mean between the sample and the domain – between breadth and depth. I think we can have enquiry questions that ask our pupils to consider second-order concepts while also giving them the best possible opportunity to learn – and remember – as much as they can of the period in question. I expect a good response to include a paragraph on each of the three challengers (the Church, the nobles and the peasants) and top answers to include a fourth paragraph in conclusion. The pupils have 45-50 minutes and all pupils write from memory without notes or sentence starters. We try and achieve this through regular self-quizzing of both the upcoming ‘sample’ (What was the most significant challenge to the King’s power in medieval England?) and the broader domain (the chronology of medieval England). You can see that I’ve tried to place an equal emphasis on this on the pupils’ knowledge grid, which they use in weekly self-quizzing as well as in class. My hope is that this strikes a ‘golden’ balance between the sample (right-hand side) and the domain (left-hand side). The pupils learn about, and have to remember, important events in medieval English history (The Battle of Hastings, the Anarchy and the Battle of Agincourt), which are not needed to do well in the end-of-unit assessment. At the same time, I hope I’ve also supported all pupils to learn the specific information that they’ll need to do well in the assessment. Next time, I’ll write a little bit more about how we use these grids, low-stakes testing and songs to try and help pupils automate people, dates and concepts so that their working memory is focussed on the most challenging parts of the assessment. This is the first blog post in a series complementing a workshop I delivered at Mathsconf6 entitled “Mathematics Pedagogy at USA Charter Schools”. Here I spoke of my experiences whilst visiting a selection of Uncommon and North Star academy schools in New York and New Jersey. 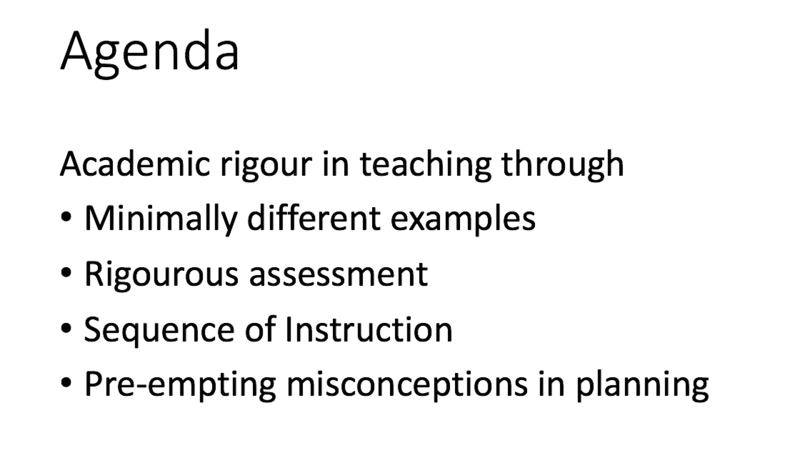 In my workshop, I discussed four examples of academic rigour that different teachers up and down the country can implement with minimal effort and maximum impact. Each blog post will discuss one example at a time. Today, this blog will address using minimally different examples during instruction. Minimally different examples are examples to explain different concepts where the difference in the algorithm between one concept and the other can be distinguished as one additional step. This was one example I witnessed in one of the classrooms I was in. The teacher presented the first expression to factorise, where the coefficient ofa in the quadratic expression is 1. This was a recap exercise where she stated the values for the coefficients, and then she determined the two values of which the product gives us the value of c, and the sum gives us the value of b. She wrote the expression in its factorised form. She then introduced the next expression to factorise. She stated that it looks visually very different to the first one, but that there is only one difference between the algorithm to factorise the first and second expression. She defined the minimal difference between the two as one additional step – which was at the start of the algorithm. She asked her pupils, “What is the greatest common factor (GCF) of all the terms in the expression?” Pupils spotted the GCF to be 3p, which she then factorised. She said “look, we now have an expression in the parenthesis which looks similar to the first expression we factorised.” The minimal difference between factorising the first and second expression was classified as one additional step. Traditionally, in my training, I would have seen the algorithms to factorise both the expressions as isolated and fragmented. 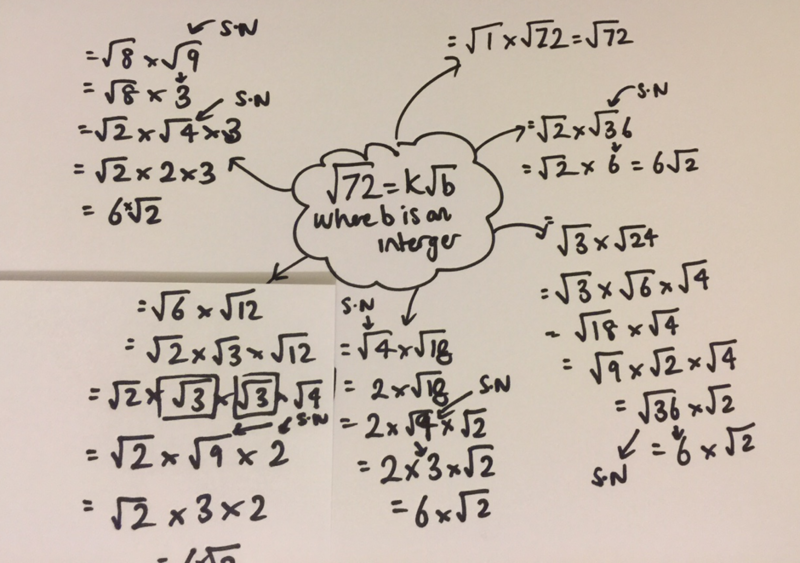 Instead, they are connected; pupils were empowered to factorise more complex expressions from prior knowledge of the algorithm to factorise the first expression. Minimally different examples are a good strategy and example of academic rigour in the classroom because they help pupils to understand knowledge and concepts which are initially complex and ambiguous. Here, the difference between the two examples is classified and determined as one additional step in the algorithm. The possibilities are endless. 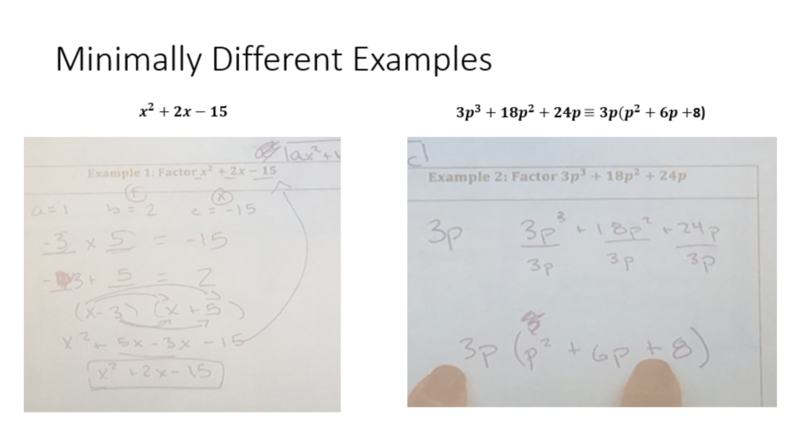 I plan to show different examples of how I have used the idea of minimally different examples in my teaching, sometime this week. Astronomy is my hard sell of physical science. Think of astronomy as the confectionary placed at the point of purchase in a well-known chain of high street stationary shops. How did the checkout boy, Alex, know I wanted a super sized bag of sour sweets at 10 am on a Saturday morning? I want the children to LOVE physics. I want them thinking, “How did Miss Dyer know I loved physics so much?!”. Which is why their introduction to secondary school physical science is astronomy. This is an eight-week unit designed with the number one purpose to blow their minds. The reason I chose to teach them about astronomy before electronics or mechanics is because it is truly fascinating. When I speak to pupils from other schools or my grown up friends about their experience of ‘physics’ at school, they tell me that they are or were taught so badly that they gave up, thinking that physics was not for them. If not for them, then who is physics for? Caroline Herschel is the first scientific enquirer that pupils are introduced to in this unit. She was a pockmarked, four-foot three-inch woman whose family assumed that she would never marry and felt it was best for her to train to be a housemaid due to a childhood bout of typhus. In fact, Caroline Herschel beat the odds to receive many honours for her scientific achievements. Together with Mary Somerville, she was first woman to receive honorary membership of the Royal Society in 1835. Children are designed to leave the lesson where they learn about Caroline Herschel thinking, “Yes, physics is definitely for me”; “If Caroline Herschel can do it, why can’t I?”; “Nebulae are amazing!”. The astronomy unit taught at Michaela goes into far more depth than any other astronomy unit that I have ever taught at any other secondary school. In this post, I have included an excerpt of the astronomy textbook that I have written and teach from, to give an idea of the content. The devil is in the detail. You cannot expect a pupil to love astronomy merely by learning the order of the eight planets and about the phases of the Moon. No, let’s not patronize the children that we are expected to teach. At Michaela, pupils learn about different models of the Solar System and references can be made to Ptolemy and his view of the Universe, thanks to Jonathan Porter’s history curriculum that includes Ancient Greece. Pupils learn that although Georges Lemaître first conceived the Big Bang theory, that the phrase ‘big bang’ was coined, ironically, by Fred Hoyle – an astronomer who disagreed with this theory. It is the links that can be made between science and other disciplines and the small pieces of information that are not usually found in science curricula, that children really love. A recent visitor to Michaela asked a group of five year eight pupils what their career aspirations were. The responses were: experimental physicist, astronomer, ambivalent (! ), mathematician and pilot. A year after being taught astronomy, some pupils actively want to pursue a career in the physical sciences. Using astronomy to sell the physical sciences? I say give it a go. I’ve worked in education since 2010, as an English teacher, Head of Department and Assistant Head in four schools. I’m currently Head of English at Michaela Community School. I write about curriculum, teaching, leadership, English and reading. You can read about what education means to me and why I do what I do here. What makes great English teachers? One of the most attractive principles in Aristotle’s philosophy is the Doctrine of the Mean. Aristotle says that what is virtuous is always between two states: one of absolute excess and the other of absolute deficiency. A good soldier, for example, is neither totally cowardly nor totally rash: he uses his reason to find a mid-point between the two – the ‘Golden Mean’. I think this is something that the best teachers do very well: they aim to be strict, without being austere, and kind, without being soft. But it is highly problematic, particularly for those who believe that the expert performance – in the long run – depends on wide domain knowledge. Over a long period of time, teaching to the test in this way erodes the domain so that our pupils only learn (and remember) the red dots (the sample), rather than blue shaded area (the domain). Clearly, this affects all subjects, but I think its impact has been keenly felt in the teaching of history. History teachers are used to creating enquiry questions that act as lenses through which they view a period of history: What was the significance of the Magna Carta? What were the causes of the French Revolution? To what extent was Alfred the Great ‘great’? These questions are designed to assess the pupils’ understanding of significance, causality, continuity and change. They encourage the pupils to see history vertically as well as horizontally; because it is only through these sorts of questions that pupils can learn about the nature of ‘power’, ‘democracy’ and ‘tyranny’, and how these initially inflexible concepts bend and flex over time. Without them, history would just be ‘one damn thing after another’. However, as important as I think enquiry questions are, I do think they present historians with a significant challenge, particularly at KS3. The reason for this is because, in effect, enquiry questions at KS3 often become the sample. In order to help our pupils write complex end-of-unit essays we provide our pupils, and our teachers, with the enquiry question weeks in advance. And, as such, the enquiry question will always inflect and distort the domain. If my enquiry question were ‘To what extent was Alfred the Great ‘great’?’ huge amounts of my teaching time will be devoted to the question of Alfred’s success as a king, rather than other significant features of Anglo-Saxon history. If my enquiry question were ‘How significant was the Magna Carta?’ much of my teaching, particularly toward the assessment, could centre on quite a narrow discussion of the events pertaining to that document, rather than other significant events in the period – the Peasants’ Revolt, the Anarchy or the story of Thomas Becket. I want my pupils to learn as much as possible about medieval England, not because I want them to do well in their assessment (I do), but because I believe that, in the long run, their success in history will partly depend on broad domain knowledge. But also because learning about these events, and remembering them for years to come, has educational worth over and above my end of unit assessment. To defer to Aristotle again, I believe that such knowledge, combined with virtue, leads them to eudemonia – a state of human flourishing. Over the next few blog posts, I’m going to write about how I’ve tried to find the ‘Golden Mean’ when it comes to curriculum design. How do I help my pupils to remember what I’ve taught them for years to come? How can I guide them to write complex answers without answering for them? And how do I strike the right balance between the sample and the domain? English – 20.02.2016 – What Happens Next, Miss? Teaching English and thoughts on the future of education. The success of ‘eating together’ has long been documented. Countless studies claim that children who eat with their families are more likely to have healthy relationships, achieve academically and maintain psychological stability and wellbeing. Coined ‘family lunch’, at Michaela we do lunchtime differently. Gone are the long lines of children counting pennies for a burger. Gone are teenage clans claiming plots in the lunch hall. We seat pupils in sixes, randomly shuffled, with a teacher or member of support staff at the head of each table. All six have individual roles (serving the food, clearing up, fetching dessert and so on) creating a joyous demonstration of working together to reap the benefits of a cooked meal. Pupils are given vegetarian fare so that any cultural group can sit together and enjoy the same food. We have a topic of conversation every day that, led by the head of the table, is discussed over lunch. Not only do these topics provide a platform to explain why we do the things we do (see my post on narrating the why), but it often gives us English teachers an excellent opportunity to speak about the joys of reading. The last minutes of ‘family lunch’ are set aside for appreciations, during which pupils and teachers will volunteer themselves to show gratitude to someone. We hear anything from, ‘I would like to give an appreciation to Mrs X for helping me to become more confident when reading aloud’ to, ‘I’d like to thank my mum for teaching me how to iron my shirts.’ All we ask is that appreciations are specific and that they have something to be grateful for every day. In this ‘Whatsapp age’, it’s hard to monitor how much time our young people spend communicating without distractions outside of school. Having daily time set aside to talk, eat and be grateful together is precious. It strengthens our relationships and allows us to have meaningful dialogues with pupils outside of the classroom. It’s a sight to behold and, without a doubt, the very best part of our day. In the past, I have confused the means and the ends. In my first year of teaching, I thought back to my most recent experience of school: A-level English. Looking at the oldest class I taught, year 10 set 5, I thought there could be no better path than the one teachers older and wiser than I had taken me on. At ages 17 and 18, I had written an essay a week. So, I decided to set my year 10 set 5 an essay a week. Obviously, this was doomed to failure. My poor struggling year 10s, so far behind in literacy, failed so utterly in this first homework I lost their trust entirely. It took a very long time to build it back up. I had confused the means and the ends. Of course I wanted year 10 to write beautifully crafted, intelligent essays. But I hadn’t considered that the way to get someone to write a great essay is not to just write a lot of essays. I see this a lot in unit planning, especially at KS4. We’ve become awfully good at drilling to the exam. But two years is a very long time to drill to the exam. We have two years toteach, with perhaps two weeks (or, if desperate, months) to drill exam practice. Too many KS4 units on English language, for example, teach using unlinked, decontextualised texts, like random novel openings or random excerpts from unlinked news articles. Although this is the format students will encounter in their eventual exam, it is surely a wasted opportunity to only teach disparate content in the ‘teaching’ stage. Of course in the end, we want students to be able to write about decontextualised pieces of writing, but in the run-up it is surely much more effective to lead students through a well-designed scheme, for example short stories, or articles linked by a common theme like feminism, or social justice – schemes that will allow students to practice key exam skills, but also learn something. The means don’t have to look like the ends. In fact, they rarely do. When successful adults turn around and say: ‘I didn’t enjoy school. I want our children to have a more fun experience than I had,’ they are confusing the means and the ends. Weall want children to have fun; or rather, fulfilling, happy lives. But you don’t get to those ends by making school all about having fun. Many adults have succeeded because of schooldays filled with hard, hard work, not fun and games. We can have fun and gamesnow, because of that hard work. In Education is Upside Down, Eric Kalenze writes about ‘engagement first’ teaching. This is the paradigm in which I was taught to teach. It was only after too many years of seeing my poorest students make insufficient leaps in their education that I realised my error. We can’t put fun first; we can’t even put exams first. We have to put learning first, and the means do not often look like the ends.